Have you always dreamed of becoming an artist? Learn and Master Painting will enhance your creativity and provide the foundational painting techniques you need to create beautiful artwork. Learn & Master Painting brings out the inner-artist in you! It is by far the world's most complete video instruction course for painting. Many people aspire to learn how to paint, but few know where to begin. Painting is relaxing and touches the creative side of our personalities. Plus, you'll have tangible expressions of your effort and imagination. It's important to find the right instruction, though, or you could spend hundreds of dollars in supplies and never use them. Learn & Master Painting is the best home instruction course available to learn to paint with oils and acrylics. Master artist, Gayle Levee, has designed interactive lessons to provide you with a solid, comprehensive foundation for your own artwork. 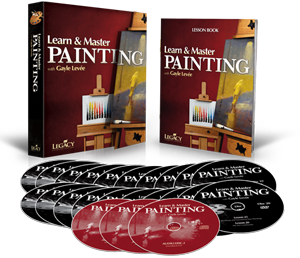 Learn & Master Painting consists of 20 professionally produced DVDs, 3 Music CDs (to listen to while you paint), a thorough Lesson Book with supplemental information, and access to a free online student support site. It is the only instructional package you’ll ever need on your journey toward painting mastery and to seeing the world through the eyes of an artist. All you need is the desire to create incredible works of art! From the onset, learning how to paint can seem like an overwhelming endeavor. But when you study with Gayle Levée she’ll walk you through step-by-step video instruction, taking you from any skill level—even if you’re a total novice—to painting with advanced techniques used by professional painters. You’ll learn how to make your paintings look realistic and believable. Gayle will teach you how to setup your studio, properly care for your materials, choose colors to best communicate your theme, and how to develop your compositions and draw objects in perspective. You’ll learn all the foundational painting skills you’ll need to become an accomplished artist. By the end of the course, you’ll understand how to get the illusion of depth and distance in a painting and you’ll be amazed at how you are able to record your experiences and the world around you in your paintings. You’ll complete several paintings—together with Gayle—from start to finish and discover a whole new way to create! Not a beginner? That’s ok. Just review the basics (you might be surprised what you don’t know) and jump into the more advanced training on perspective and color theory. Many classical and formal training programs don’t include the information you’ll learn here. When not accompanied by detailed video instruction, printed materials alone can leave you frustrated and confused. Online instruction is difficult to follow. Private instruction is costly and inconvenient. Learn & Master Painting is the perfect solution to learn how to oil paint—you’ll be thrilled by what you can create! You'll learn to make art, think about art, and discuss art. We want you to be delighted with Learn & Master Painting. If you are not, simply return the course within sixty days for a full refund of the purchase price. No questions asked. It's that simple. We get very few returns, but when we do, they are handled promptly and courteously. Order now with confidence.